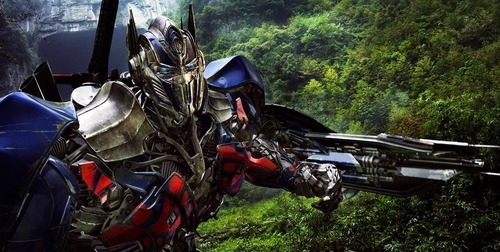 If someone says the word “transformer” and the first thing that comes to mind is an electrical device in a covered box outside your house quietly transferring energy between two or more circuits then Transformers 4 Age of Extinctionmay be somewhat unexpected. It would be completely unexpected if there hadn't been a successful cartoon series and line of toys from Hasbro in the 1980s and three earlier films in the wildly-popular Michael Bay Transformersfranchise. Both the source material and films are about alien robots who can disguise themselves on earth by transforming into things like cars, helicopters and trucks. Like the previous films Transformers 4 is a sci-fi soap-opera with a central hero, the Autobot Optimus Prime, and a central villain, the Decepticon Megatron. At the end of the third film Transformers: Dark of the Moon (2011) Optimus Prime defeated Megatron by pulling his robot head from his robot body. In an interweaving plot line in Transformers 4 Age of Extinction this severed robot head is discovered to be quietly manipulating greedy political bureaucrats and scientists with the goal of creating a new army of evil Decepticons and his own personal 'rebirth' into a new and improved robot body. 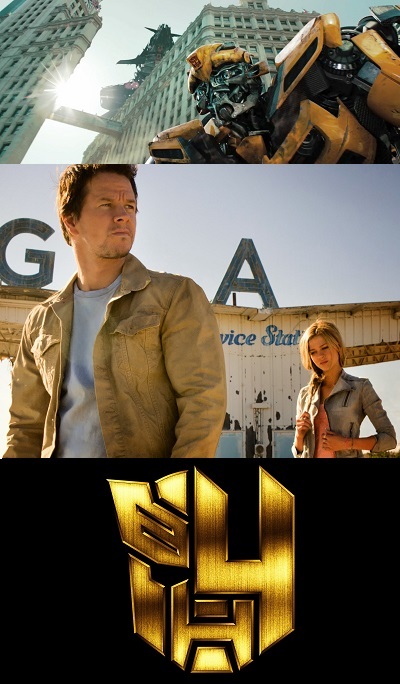 Megatron is not the only robot needing improvement; early in the film the robot hero Optimus Prime is discovered by a penniless inventor with a heart of gold, Cade Yeager (Mark Wahlberg), who buys what he thinks is a beat-up old semi-truck which he plans to sell for scrap metal. Yeager and his friend and business partner Lucas Flannery (T.J. miller) soon discover that the metal is alien and what they really have on their hands is a Transformer not a beat-up old semi. This chance meeting provides the plot with a new cast of human characters which include Yeager's daughter Tessa (Nicola Peltz ) and eventually Tessa's boyfriend, the Irish race car driver Shane Dyson (Jack Reynor). Quickly the father, daughter and boyfriend along with Optimus Prime find themselves on the run desperately trying to avoid Cemetery Wind, a C.I.A. black-ops team hunting down all the Transformers. While the plot sounds rather involved it's really secondary to the special effects and CGI extravaganza served up by director Michael Bay. 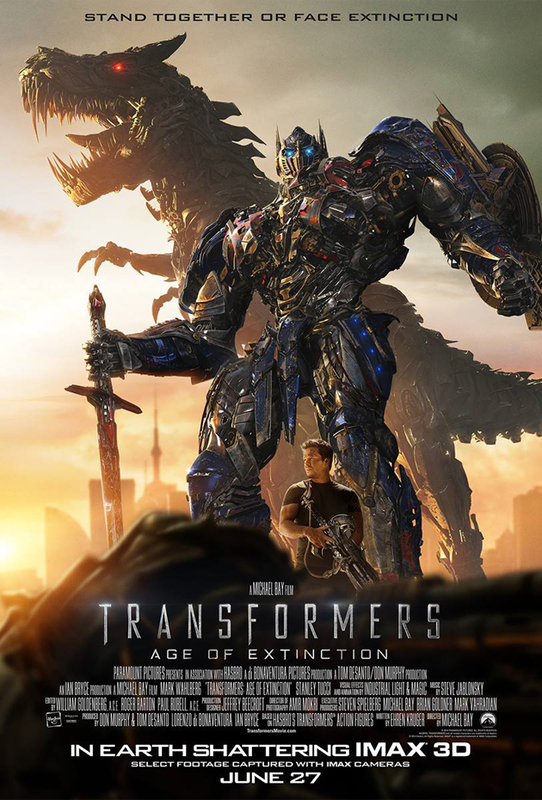 Clocking in at 165 minutes Transformers 4 Age of Extinctiondelivers an impressive amount of visual effects. In the past, Spielberg's Jurassic Park (1993) wowed audiences with about 15 minutes of actual CGI and animatronic dinosaurs. Today’s filmgoer get more bang for their buck. In Transformers 4 there may only be about 30 minutes of human interaction that doesn't in some way involve CGI. For the Transformersfan who wants to see muscle cars and Lamborghinis transform into robots and fight each other there will be a lot to enjoy. On the other hand there will be filmgoers who would prefer settling into a dentist’s chair than watch this film. On a positive note there is a question as to whether people should invent certain things just because they can, a philosophical question that gets at the film’s underlying theme: responsibility. Yeager takes seriously his vocational responsibility as a father to his daughter Tessa; Attinger abuses his responsibility as a C.I.A. agent for his own financial gain; the scientist Joshua Joyce repents of the mechanical monsters he blindly created while walking away from his ethical responsibilities as an inventor; and Optimus Prime struggles with the responsibility he took on to be a protector of the people of earth after they turned on him. Buried in this film are story elements that feel reminiscent of concerns Martin Luther addressed in the Table of Duties section of the Small Catechism. For example, fathers are admonished to "bring up [their children] in the training and instruction of the Lord" and Cade Yeager is shown repeatedly instilling in his daughter Tessa the virtue of leading a sexually pure and decent life, encouraging her to be mindful of what she says and does in that regard. As in other recent movies like How To Train Your Dragon 2 (2014), Godzilla (2014) and World War Z(2013), Transformers 4 provides a generally positive view of fatherhood which isn't played for laughs and is held up as a noble and good calling. Since the film is geared towards a younger audience, parents may want to ask themselves if violence and excessive destruction are as big a concern as profanities and sexuality. The film contains the latter two elements but the former is the film’s central focus. Families will need to decide if the degree of violence and destruction is acceptable. There is certainly an obvious glamorization of violence within the film and much of it is designed to be oddly beautiful looking. Parents will need to ask if this content overshadows the positive aspects of its father/daughter story line. A cut above the last two instalments in the franchise, Transformers 4 Age of Extinctionis the best robot-cars-riding-robot-dinosaurs-fighting-other-alien-robots-with-average-joe's-scientists-and-C.I.A.-agents-caught-in-the-action movie available this summer. Director Bay has stepped up his game providing a better cast of human characters for his audience even though their general character development mostly remains superficial. If the film does well this summer expect to see more brash, mildly offensive, robot explosions in the not-too-distant future. For those who have never seen a Transformers movie, and have no interest to see one, they will likely feel lost in the midst of all the explosions and action and find themselves wishing they were watching the benign electrical box transformer. For viewers who want this kind of movie they will certainly get their money’s worth. Luther's Small Catechism, Concordia Publishing House 2006, pg 38.